If you know me, you know I absorb ideas easily. I’m not saying I can’t come up with ideas, but a good deal of what I do well comes from others. A friend of mine in Portland came up with the very cool idea for making inexpensive AoE templates for D&D. All you need is a quick trip to a craft store to get 18-gauge wire. They sell it for working on floral arrangements. The wire needs to be straight (not curved), but can be in several small sections. Then, from a hardware store, purchase Spline, which is the rubber black ridged stuff that is pushed into the border of a screen door to hold the screen in. The .125 diameter works well with the 18-gauge wire. Take your first wire and stick it into a section of spline. Now bend the spline to make a right angle. Measure this on a battlemap (or 1″ grid) and guess where you should cut the metal so you end up with the total distance desired (a total of 3″ for a burst 1 template, including the curves). Once cut, cut the spline. Now repeat for the remaining sides. I made two of each template except for a single of the largest with one pack of metal rods. The templates are really useful for zones, for quickly establishing what can be affected, and even for measuring ranges. Note: you can use the same technique for D&D 5E, using those sizes. You can also make triangles for cones. DM David talks about a similar technique for 5E on his blog. 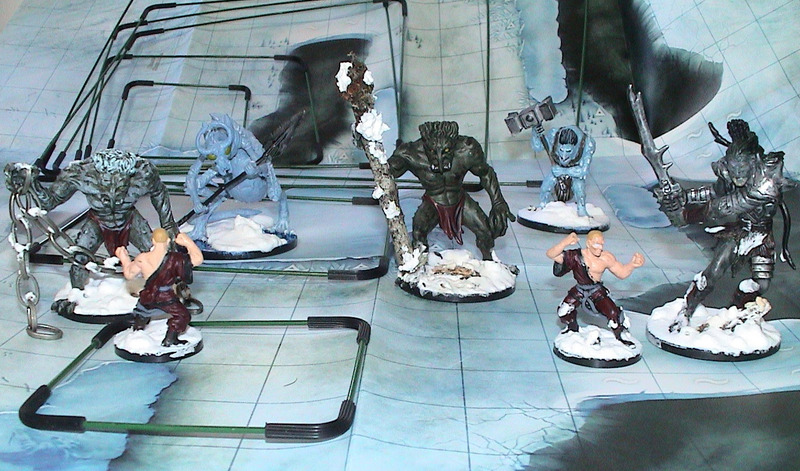 This entry was posted on October 1, 2015 by Alphastream and tagged Miniatures, Props, Terrain.